Scanner for Remote Desktop allows driver free scanning via any application in a remote session using a local scanner creating a virtual scanner on the server side. Scanner for Remote Desktop creates a virtual scanner on the server and allows scanning via any application in a remote session using a local scanner. You don't need to plug your scanner directly into the server machine to scan in a remote desktop session (Microsoft RDP or Citrix ICA). You don't even need to install your scanners's driver on the server! Now users can get separate access to their own scanners regardless of how many scanners are being redirected to the same server at the same time. The scanners are isolated within each individual session, so you don't need to scroll through a long list of scanners in the scan dialog to find the one plugged into your workstation! 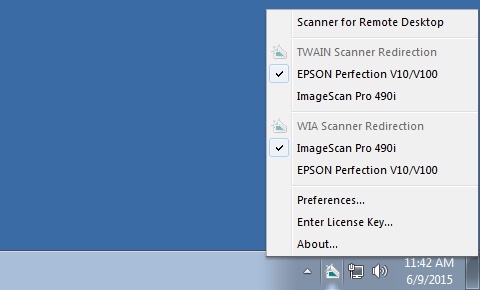 Scanner for Remote Desktop supports 3 color modes and 3 resolutions, scanning on more than 10 standard paper sizes, both portrait and landscape orientation. Key features: - supports both Microsoft RDP and Citrix ICA - doesn't require any drivers on the server side - each scanner is isolated within the session Start scanning in your remote session with Scanner for Remote Desktop! PortableRDC allows you to take your pre-defined remote desktop connections connection with you, without configuring everything on every computer. This site does not contain serial number, crack, keygen Scanner for Remote Desktop serial number : serial number is the simplest type of crack. A serial number(cdkey,product key,etc) is register the program as you may already know. a crack or keygen may contain harmful software. If you cannot find the exact version you want, just give it a try. for more information read .nfo/.txt/.diz file include in zipped file.